It’s that time of year again. The festive season brings with it the need to give even better gifts than the year before. Whether it’s for business or pleasure – we all know a frequent traveller. This begs the question – what are the perfect gifts for travel lovers? Business travellers tend to have their trip jam-packed with scheduled meetings, presentations, conferences and the like. On the other hand, avid globetrotters are more likely to maximize their time in a particular destination by doing everything they can to learn more about their new locale. Regardless of the reason for travelling, there are certain types of gifts that anyone on the move will enjoy receiving. What would be the perfect gift for someone who travels regularly? Some examples could be a gift that makes a plane journey more comfortable or gadgets to while away the time. If the recipient loves to capture their adventures on camera, a stylish and functional camera bag is bound to be appreciated. We know how stressful it can be combing through the internet or battling through overcrowded stores to find the perfect gift. That’s why we asked our travel community to share their travel gift ideas with us. From budget-friendly treats to must-have travel goodies, these varied gifts will impress. We all know that Christmas with all the trimmings tends to do damage to our bank accounts. The good news is there are budget-friendly gifts you can get that will make a traveller’s life easier and more enjoyable. Fitness expert and regular traveller, Tara Laferrara, bought this unisex passport holder during one of her international travels and uses it whenever she’s on the move. Get this stylish and affordable leather passport holder for the traveller you know whose passport is constantly getting stamped on the go. Chewables are not the most exciting gifts to give. However, for the globetrotter you know who often suffers from fatigue and nausea after long-haul flights, these gluten-free tablets will be much appreciated. PR Guru, Katie Rose, is a fan of Zaca’s refreshing berry flavour and the fact that the tablets don’t need water for consumption. A convenient and practical travel gift is not to be sniffed at. Travel writer, Christian, believes that for travel nomads a tracker on your keys is invaluable. Pick one that allows you to use an app to quickly locate the tracker and make it beep. Christian recommends one of the foremost names in the tracking game – Tile, and advises you to select from their Pro version. This Christmas, when it comes to top gift ideas, how about giving a present that’s eco-conscious? Take Nomader’s functional and durable water bottle for example. Not only does it come in an assortment of colours, but also this reusable bottle will keep you fresh and hydrated during your journey. What’s more, this handy gift is portable and won’t take up lots of space in your backpack or carry-on. Searching for what to give your stylish friend who’s often travelling the globe? Look no further than this versatile and stylish Highland travel scarf courtesy of adventure travel brand, Royal Robbins. This functional and lightweight scarf has 5 buttons and 5 buttonholes. When the temperature drops in a plane cabin, they can wear the Speckle Heather merino wool blend accessory as a shawl, poncho or cardigan. These useful tools tend to offer solutions to our travel problems. Some can even be labelled as lifesavers! Enhance your friend’s travel experience with these handy gadgets. While travelling, travellers use their phones for photography, communication, wayfinding, electronic payments, airline tickets and even sometimes for health! Travellers simply can’t afford to have their phones die. The jetsetter in your life will never get caught without phone power when they carry a Boosa portable phone charger. Boosa is a 10000 mAh power bank that will charge an iPhone 8 over 3.5 times. That’s over 50 hours of continuous power for your phone – making it the ultimate travel hack! Travel writer and photographer, Khristy Choo, can’t do without her headphones when she’s in transit. When we asked her what was on her Christmas wish list, she told us she’d like to receive iLive’s, Noise Cancelling Wireless Headphones. This headphone has great battery life and is easy to fold and store in the included carrying case when you’re on the go. Being travel enthusiasts ourselves, we like the fact that the headphones allow you to control music and calls with on-ear controls without ever reaching for your paired device. When it comes to handy gifts for travel lovers, the Travis Touch Translator is ideal for the frequent traveller who’s keen on communicating in the native language when they are in a new location. This nifty pocket-sized gadget translates and understands over 100 languages around the world using advanced Artificial Intelligence software. This is how it works. You speak to Travis Touch in one of the many recognised languages, and Travis will translate it and say your translated sentence back to you verbally in the language you require – or show it as a text translation – or both -depending on the language. Travel blogger and writer, Sara Essop, reassures us that this gadget will make language barriers when travelling a thing of the past. Whether your loved one is a fly by the seats of your pants backpacker or a luxe-oriented traveller, they’ll appreciate luggage that allows them to store the essentials. Furthermore, when it comes to luggage, durability is the name of the game. 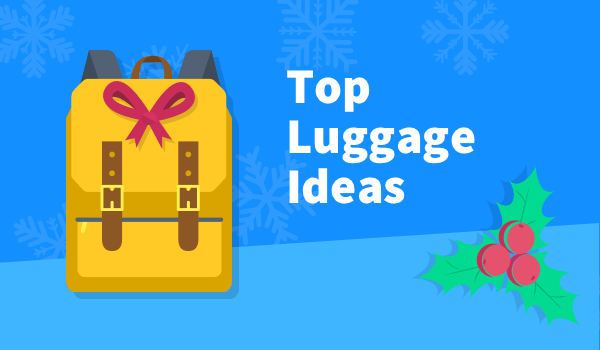 Our curated selection of top-notch luggage will make perfect gifts for travel lovers. Zoetica’s is a socially responsible company whose mission is to make sure we travel waste-free. One of their popular travel products is the ‘Explorer Backpack’. Now, this is no basic backpack, it comes with Zoetica’s pre-packed zero-waste system. This system includes a water bottle, thermos, stainless steel cutlery, an organic cotton napkin and more essentials for the frequent backpacker. There’s also room for your travelling friend to store their laptop and other necessities. For the travel enthusiast who is always complaining about needing a backpack to store their electronics – this gift will make their Christmas a merry one indeed! These backpacks have places for all of their gear with built-in cable management to keep devices organised. They also have a built-in expansion zipper, a luggage pass through, and many other travel-minded features. Samsonite has been equipping travellers worldwide with their luggage. It’s a top legacy luggage brand and if you’re feeling generous, the recipient of this timeless gift is bound to be grateful. With a few luggage lines under their belt, we’ve decided to go for their Armage line for the holiday season. The Armage line is one of Samsonite’s most advanced luggage bags. It comes with a TSA approved cable zipper lock, a telescoping handle to reduce back strain and a built in USB for charging electronics on-the-go. Chapped lips, dull looking appearance —air travel is known for being harsh to our skin. After a long-haul flight, our bodies can take a beating due to the changing temperature in an aircraft. Consequently, anyone who travels often will appreciate receiving travel-friendly products that combat the potential beauty problems that arise from frequent travel. Fitness Guru, Tara Ferrara, thinks CALA’s facial sheet masks are great for long-haul flights as the hydrating sheets are “mess and fuss-free”. She also advises long-distance travellers use these masks to “combat the harsh effects of the lack of humidity in the plane on our skin”. If you’ve ever arrived at your final destination and balked at your dry skin and frizzy hair, Virgin Marula Oil will be a welcome gift! This light and moisturising oil is often referred to as an eco-friendly “miracle oil’. A few drops now and then helps combat dry spots on your face and body, leaving your skin feeling soft and supple. For an added bonus, it also tames hair frizz. Male travellers have beauty needs too. If you’re looking for top gift ideas, this holiday, give the gift of protection—sun protection that is. This ultra lightweight Daily SPF 30 + Moisturizer was developed specifically for men’s skin, which tends to be thicker and produces more oil compared to women’s skin. The water-based moisturiser is infused with cactus extract making it both fast-absorbing and cool to touch. Context Travel recently launched its first-ever gift card, just in time for the holiday season. The Context vision is to connect avid travellers with local experts and culture; to give them access to places that might otherwise remain out of sight to the casual visitor. Their gift card allows the lucky recipient to customise their experience based on their individual preferences – whether they’re a foodie, an art or history buff, fashionista and more. These global tours are all led by guides who are experts in their respective fields. Price: This depends on how generous you want to be. A semi-private tour averages between $100 – $200 per person, while a private tour averages between $250 – $500 per tour. This Christmas give the gift of lounge access. When it comes to ideal gifts for travel lovers – globetrotters will enjoy reaping the benefits of their LoungeBuddy gift card which gives them access to a multitude of airport lounges. Having airport lounge access lessens the stress of traveling and can elevate your airport experience. Your friend will love getting this gift card because after the hustle and bustle of navigating through a crowded airport, they can use their LoungeBuddy gift card to unwind in an airport lounge. In the lounge, your friend can either choose to get some work done or help themselves to refreshments before their trip. This airport lounge experience will help to ensure they board their flight relaxed. Price: Travellers can pay a single price with LoungeBuddy which is typically between $35 and $50. Tis’ the season to give and receive, so we’d love to know what travel goodies you’d put on your Christmas Wish List. 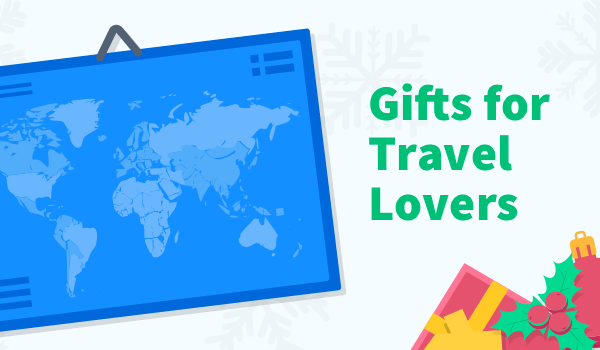 Also, what do you think are the best gifts for travel lovers? Unfortunately, that doesn’t eliminate the fact that holiday travel can be hectic and stressful. Apart from battling through overcrowded airports, there’s also the issue of dealing with flight mishaps. If your flight is cancelled, delayed or overbooked, AirHelp will help you to get compensation for your inconvenience. Such compensation can be as much as $700. This means that if for any reason your Christmas trip doesn’t run smoothly, we are here to enforce your air passenger rights.